Here's another example of Brian Vermeire's outstanding design work. 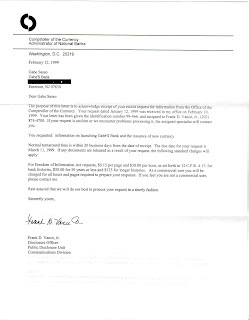 Reading this again now, I can't believe I told the government I'd sent them $250.00. I assumed this would go straight in the shredder with no response. I took them long enough to respond. They were probably off on a 3 month coffee break. But how kind of them to provide the address for my next letter. That's service! No one could take this seriously, could they? On this stationery? 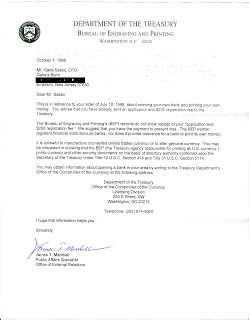 And if somehow you can look past the absurdity of the letter, how can you take this deposit slip seriously? 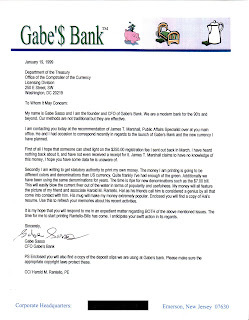 I have to give Brian credit here not only for the deposit slip design, but for the "cetegories" as well. This entire thing was his baby. 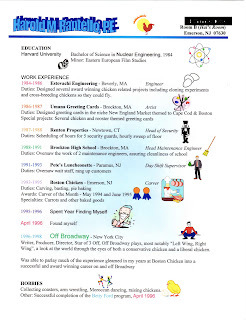 This resume might be Brian's masterwork. At least as far as designs he created for me go. I LOVE this thing. I have no idea what they're talking about. It sounds like they actually want to help me open my own bank. 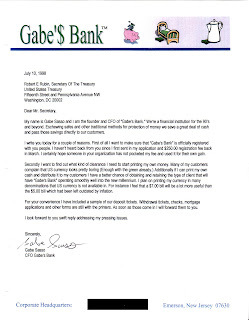 And unlike the other people they don't seem opposed to the idea of printing my own money. Like everyone else, they just want to get paid. This was the last I heard from them. I was going to pursue it further but decided to leave the G-Men alone. Maybe I was taking the X-Files too seriously.